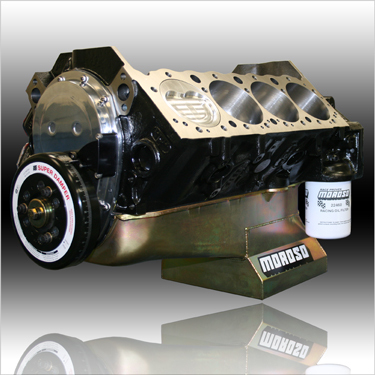 We Developed Our New Small Block "Power Adder" Short Blocks For Blower Or Turbocharged Applications. With The Availability Of 3 Different Stages You Can Decide On The Power That You Need!! Includes: Custom Solid Roller Cam Based On Your Application, Rollmaster Billet Timing Set w/IWIS Chain & Torrington Bearing, GM Performance Chrome Timing Cover, Tavia Pointer, SFI 6.250" Hi-Performance Balancer (ATI Double Key Standard on Stage II & III), Moroso 6 Quart Street & Strip Stroker Oil Pan, Moroso High Pressure Oil Pump w/Welded Pickup, All Gaskets, Seals and Hardware. Completely Assembled With Camshaft Degreed-in and Timing Pointer Set For True TDC.